Like The Amazing Race dominated the Reality-Competition category, so too did Survivor host Jeff Probst dominate the Reality Show Host category. Probst has been a deserving winner, but there’s another guy out there too who’s put in 10 equally excellent years in front of the camera. 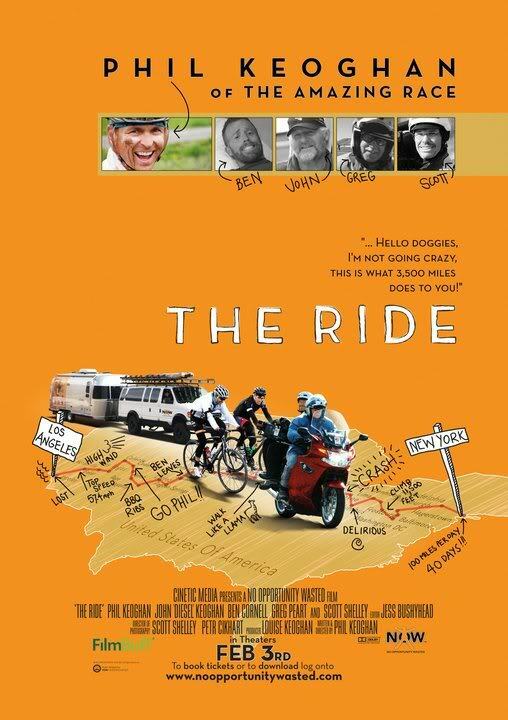 Phil’s Film The Ride To Premiere February 3rd! In 2009, Phil Koeghan biked across America in support of the National Multiple Sclerosis Society and he filmed every mile. Now that film makes it world premiere this February 3rd online at Phil’s website, NoOpportunityWasted.com. You can log on to the website as well to find out if the film will be screening at a theater near you. Phil will be at each of the screenings including theaters in Los Angeles, Denver, Minneapolis, St. Louis, Chicago, Pittsburgh, Philadelphia, Boston, Dallas, and New York. 100% of the box office will benefit the National MS Society. Be sure to support Phil and this great cause! The eyebrow says it all. 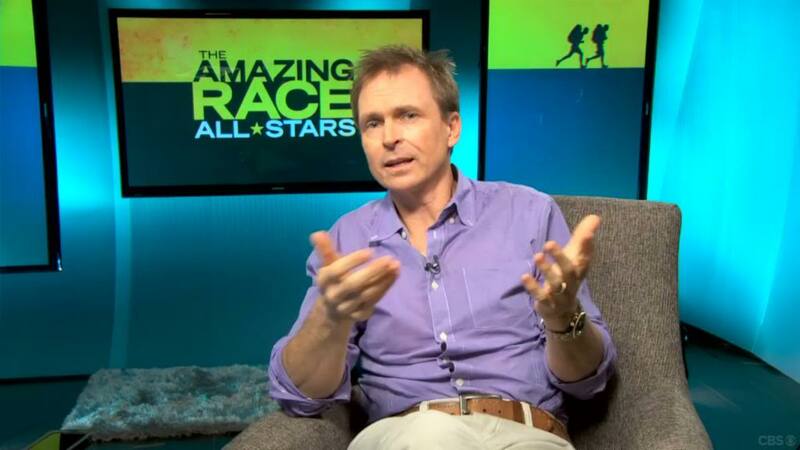 The Amazing Race‘s Phil Keoghan has been an amazing host and the only one suited for the series. An adventurer himself, Keoghan loves being part of a worldwide adventure and enjoys seeing regular everyday Americans doing the same. Over the past 16 seasons, Keoghan has become one of the best parts of the series, adding humor and levity when needed, but being compassionate and serious as the tension of the competition wears on the teams. Keoghan’s willingness to poke fun at himself, like standing in just his underwear in the snow to demonstrate the upcoming task or diving into the sea himself to explain the rules, is a great example of how much he enjoys what he does. When needed, he understands the contestants, helps comfort them or laughs right along with them. And as the master of ceremonies, no one explains tasks and challenges with as much fun as he does. While The Amazing Race has enjoyed deserving annual wins at the Emmys, it is time its equally deserving host is recognized as well. Another television season over. You know what that means! It’s Emmy season! Networks and studios have been sending those For Your Consideration DVDs and swag to Emmy voters hoping to get a shot at the gold in August. Our very own Phil Keoghan will embark on a 40-day, 3,500 mile coast-to-coast bike ride to visit local casting calls for TAR15, local CBS affiliates, local GNC stores (which is sponsoring the ride), sign copies of his book No Opportunity Wasted, and raise awareness for the National MS Society and Bike MS.
Phil Keoghan, host of CBS’s THE AMAZING RACE, will embark on his boldest adventure yet – cycling from Los Angeles to New York – a ride that will average 100 miles per day for a total of over 3,500 miles, spanning 40 days with pit stops in over 30 different cities. Phil Keoghan’s “Ride Across America Presented by GNC” will kickoff on March 28 in Los Angeles and end on May 9 (the day before the finale of THE AMAZING RACE 14) in New York. Along the way, he’ll attend meet and greets with supporters at local GNC stores, visit CBS affiliates, attend open-casting calls for the next installment of THE AMAZING RACE, sign copies of his best-selling book No Opportunity Wasted, and ride alongside ex-Racers and fans of THE AMAZING RACE. He will also be participating in rallies hosted by the National MS Society to build awareness for Bike MS and the MS movement. 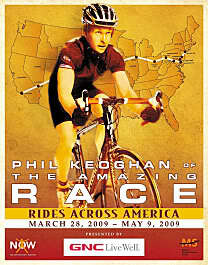 Phil Keoghan’s “Ride Across America” includes visits to such cities as: Las Vegas; Denver; Lincoln, Neb. ; Des Moines, Iowa; Chicago; Fort Wayne, Ind. ; Columbus, Ohio; Pittsburgh; Washington D.C.; Baltimore; Philadelphia and New York. Phil’s exact route will be released soon. “We’re also very excited to have the opportunity to be the sole retailer of Phil’s new nutritional product, NOW OSM ‘One Square Meal,’ a total meal replacement that is guaranteed to be a top seller at our GNC stores,” added Dowd. Phil Keoghan vs. Julie Chen! – Sunday at 8pm on CBS! The battle that’s been 7 years in the making. Two of reality TV’s hosting elite will battle it out on CBS’ Million Dollar Password this Sunday at 8pm. Amazing Race‘s Phil Keoghan and Big Brother‘s Julie Chen will play with contestants on the Regis Philbin hosted game show. There’s no time to waste as Nick & Starr the first clue on the final leg of the 13th season of The Amazing Race. Teams will travel to their final destination city, Portland, Oregon. There, they will take a taxi to Tilikum Christian Camp & Retreat Center in Newberg, Oregon where they will find their next clue. Nick & Starr can’t believe they’re at the end of the Race, but that they are still a long way from the end. They have a good feeling about the final leg. Dandrew say they persevered through the Race and that they aren’t going to just be chicken feed for Nick & Star and Ken & Tina in the final leg (he spoke too soon). Their “Moscow miracle” brought them to the final 3. Ken & Tina have their eye on the prize as they always have, and they are positive about where their relationship is heading. Tina promises not to help anyone but themselves this leg. All the teams take the same Lufthansa flight through Frankfurt and upon their arrival in Portland, the Race has really started. Nick & Starr get out of the airport first, but Ken & Tina are right behind. Dandrew, already has trouble with their taxi driver and the rattlesnakes are cued. Nick & Starr’s driver drives past the street they were to turn at allowing Ken & Tina to get to the clue first and find the Detour. In this Detour, teams must choose between two activities used to improve the balance and reduce the fear of people working in Oregon’s logging industry. In High & Dry, each team member must climb 30 feet up a tree, walk across a 40 foot log and leap for one half of their next clue hanging from a trapeze. If they fall without their clue, they have to start over. In Low & Wet, teams must walk 850 feet across the water on log bridges to get their clue. Ken & Tina choose the High & Dry as Nick & Starr arrive. Dandrew are still lost and they use the driver’s cell phone to try to get them to the retreat center. Ken quickly grabs his clue half, and Nick catches up. Tina’s helmet becomes a nuisance as she stops every couple of feet to put it back on the top of her head to avoid the strap from choking her. Starr, meanwhile, passes her and the siblings are off first, but Ken & Tina are right behind. Teams now make their way to The Bridge of the Gods where they will zip line 2000 feet to the island below for their next clue. On the way, Nick & Starr’s taxi driver drives past the exit again, allowing Ken & Tina to move back into first. The siblings arrive just as Ken & Tina get their next clue. Before moving on, teams have to complete a puzzle board that had the teams needing to remember their time on the Race. Each team had a puzzle board that had 10 spaces. Uncovering each space, teams would find either a Route Marker, Detour, or Road Block symbol. They’ll use those clues to search among 150 clue boxes for pictures that correspond to the symbol and the leg of the Race. When they have the correct picture in the space, a green light will light up and the teams can move on to the next leg. When they have all 10, they can look for their next clue. Ken & Tina and Nick & Starr are neck and neck at the task while Dandrew is still on the road. The pressure is on as the two teams run around the field of clue boxes. Tina doesn’t want to worry about the siblings, but Nick & Starr pass them and regain the lead. They get their next clue telling them to head into downtown Portland, to the Portland Building where they’ll have to search for a green dinosaur located at the Standard Plaza across the street. Their next clue is waiting there. Ken & Tina are right behind Nick & Starr into downtown Portland. Ken & Tina make a right turn while Nick & Starr head straight. The siblings arrive at the building first with Ken & Tina getting stuck in traffic. Nick & Starr find dinosaur and the next clue telling them to head to the Alder Street Cart Pod where they must search for a Russian Food Cart. They take off while Ken & Tina stay close behind. At the Russian Food Cart, the lady hands Nick & Starr their next clue telling them to make their way to “where the magic is in the hole” referring to Voodoo Doughnut where their next clue is waiting outside. Nick & Starr ask a woman if she knows where it is, but she suggests looking in a phonebook. They eventually get directions from a guy on the corner. Ken & Tina get their clue and ask that a woman for directions. The same woman who didn’t know for Nick & Starr gives Ken & Tina specific directions and even tells them to go this other way since the people before them went the long way. Running through downtown Portland, Nick & Starr finally arrive at the clue which tells them to head to Pittock Mansion and follow the marked path to the finish line. They run to find a taxi. Ken & Tina get the clue and they head off to find a taxi also. Neither team has any luck getting one fast as a taxi with a passenger refuses Ken’s $50 offer. Both teams finally find taxis and it is a taxi ride to the finish line. Ken & Tina say a little prayer as Starr is about to freak out with excitement. The Philiminated teams are already cheering at the finish line as the winners’ taxi arrives and Nick & Starr come running to win The Amazing Race 13. Ken & Tina take 2nd and Phil asks them if they were able to reconnect on the Race to which Ken replies with reaching into his Race pack and pulling out a pouch holding a ring to which he puts on Tina’s finger (with Phil looking over his shoulder) and says he wants to start their relationship over right at that moment. They kiss. Dandrew officially finishes 3rd and Dan says what a perfect way to end the Race, exactly the way started, with a bunch of mistakes. And so another season of The Amazing Race is over and we have to wait only 10 weeks for the next season! Much kudos to the TAR editors for making the episode very exciting even though it was pretty obvious who was going to win (long before the last taxi ride). It was also great though that Nick & Starr and Ken & Tina stayed so close throughout the leg, you didn’t need editing for that. The Detour seemed pretty unexciting, but the Road Block-esque final task was great. It would’ve been more awesome if it was right before the finish line like in TAR8 and TAR9. Since those two seasons, I’ve thought it would be so much more exciting to have the final task right before the finish line. The added tension of having the finish line just around the corner or a run away is so much better than a taxi ride. Ken & Tina… They raced almost as well as Nick & Starr did and more than deserve 2nd place. Ken’s “proposal” at the mat was great and best of luck to them. Nick & Starr… They couldn’t be denied the win, they dominated a good part of the Race, by no means perfect, but more then deserve their 1st place win. Andrew & Dan… Well, like Dan said, they ended like they started… with mistakes. Story of the Race life I guess.